St. Mary's FC was formed in the summer of 1999 after Jonathan Jackaman and Jon Clements returned from University in Aberystwyth. Initially the side was intended to be a "B" team for the highly successful Aldridge Parish team founded in 1994 by Grayson Marlow, Ian Cornell and David Ford. However, we decided to set up our on team called St. Mary's FC being completely independent. For one season only, there were two teams linked to Aldridge Parish Church in the West Midlands Christian Football League. Our first match was away at Alpha in which we came from 2-0 down to win 3-2.The rest of the season was full of ups and downs, with the downs being more predominant than the ups.A fine cup win over first division Rowley College was tainted by the poor end to the season in which we finished 3rd from bottom. The next season started promisingly with us occupying a position in the top three after the first few games, however this wasn't to last and we went three months without a win and ended up finishing second from bottom. The following two seasons went along similar lines, towards the end of the 2000/2001 season panic set in. We realised that if we didn't win the last game of the season against promotion chasing Amblecote, who needed to win to have a chance of finishing second, we would finish bottom of the League. Needless to say, we lifted our game when we needed to and comfortably won 3-1, however this result glossed over the fact that we, as we had been since 1999, were struggling for consistency and the side changed from week to week due to player absences. 2002/2003 was a replica of the previous season, the main difference was that although we finished second from bottom again, this time it was much more comfortable and points wise we were as near mid table as we were bottom position. This season did lead to the most famous result in our history. In late December, we lost 10-3 at home against run-away league leaders Clarendon. When drawn against them in the League Cup Quarter Final in March, few held out much hope. As you may have gathered we pulled off our greatest ever win 1-0 with the help of a penalty save from Mark Yarnall and some dubious refereeing decisions (in our favour for a change). We progressed into the Semi-Final and although we battled well local rivals St. Thomas' defeated us 2-0 and went through to the final. Last season was much improved, we were no longer a weak link and dismissed the poorer sides convincingly including an 8-0 victory against Brierley Hill. We did struggle against the stronger teams though and finished in mid table after losing our last four games. St. Mary's continued to progress and improve in the 2005/6 season, consolidating their place in Division One. 2007: St. Mary's most successful season, seeing them placed fourth in Division One and winning the League Cup and later in December they win the Kevin Kovacs Charity Shield with a 3-1 over League Champions Amblecote. 2008: I was going to write 'St Mary's most successful season ever' but that's what I put last year, so I won't. It's nice to see a club that has worked hard throughout their history continue to improve year on year and that's pretty much what they've done. St Mary's went one better, retaining the League Cup and coming second to a rampaging Clarendon. It could be argued that St Mary's are the second best team in the League but when you consider that they managed to beat Clarendon in the Cup Final who in my opinion were the best side in 2008, the St Mary's boys have a shout for the honour. 2009 will be interesting as the only way to better this year's achievement will be the League title. Ed Walker - June 2008. 2009 It was pleasing to see St Mary's win the league this year. Not only is it a new name on the illustrious trophy (I like to see the silver shared around) but also as they have grafted away at the bottom of the league only to come good. They had been criticised as 'too nice' by former manager Gareth Powell and it's great to see that they have not lost this attribute. They are a nice bunch of lads who play attractive football. The 2008/9 title race was a runaway between two teams. The rest of the division were trailing in the wake of Clarendon and St Mary's eventually finishing on 48 and 49 points with King's in third on 31, a massive 17 points in arrears. The season was dominated by these two teams with them both reaching the Cup Final again. St Mary's sneaked the Kevin Kovacs Memorial Trophy back in August on penalties but Clarendon appeared to have the upper hand beating St Mary's 3-0 on 20 September. Clarendon then surprised everyone by dropping points for several weeks and it seemed like St Mary's had their name written on the trophy. But Clarendon came back at St Mary's with win after win only for the clubs to meet in 'the decider' on 14 March. The match and the title appeared to be heading Clarendon's way with them winning 2-0 only for St Mary's to steal a point, 2-2 and the impetus was back with St Mary's: Win all their games and with it the title. The baton was passed back to Clarendon as St Mary's drew next week at home to Halesowen. Previous to the Clarendon game, St Mary's had scraped a 1-0 win against Wolves and drawn 3-3 with City, so was it all over? Just one win in four games. On the deciding Saturday, St Mary's rolled off a log and beat Sheldon 6-0 whilst Clarendon could not find the net against St Matthew's, who had beaten them earlier in the year and the Division One trophy was finally theirs. I think the relief was palpable in the Cup Final, with Clarendon running out easy winners. St Mary's just didn't seem to turn up. Clarendon were clearly intent on winning the Cup having lost the final to St Mary's the previous season but losing the league title too. Following St Mary's success in the 2008/2009 there were some bleak years to follow. Although remaining in contention for the next few years and finishing runners up in the 2009/2010 season a lack of consistency cost St Mary's chances of silverware. The years that followed could be described as a time of transition with players coming and going without a solid starting eleven developing. 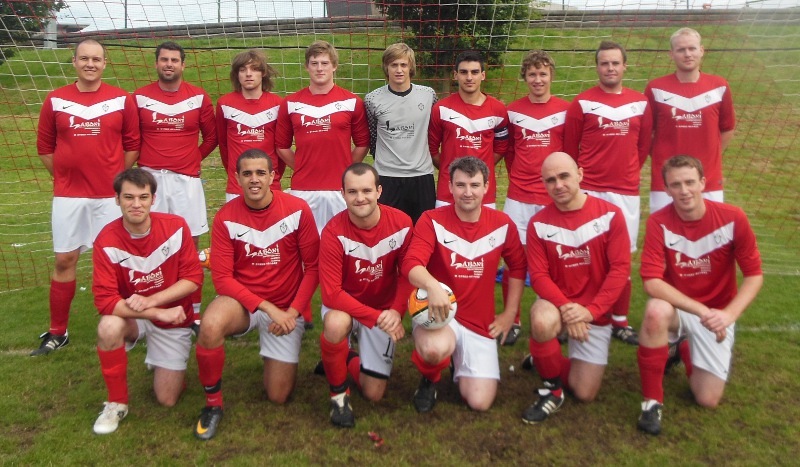 The 2010/2011 season saw St Mary's finish third behind champions City Church and runners up Clarendon. In the 2011/2012 season St Mary's had a season that they will want to forget with the club finishing fourth some 24 points behind champions Clarendon. This season was the first time since 2007/2008 that they hadn't been part of the title chase and at the end of this season it was apparent that changes were needed. The 2012/2013 season saw a number of new faces come in following returning to Aldridge after completing their time at university. Although again St Mary's did not compete for the title this season it was a transition season where a new team was starting to gel together. The 2013/2014 season saw hard work and resilience pay off. After a tough pre season St Mary's got off to an ideal start with the first game of the season away to title contenders City Church which saw St Mary's win convincingly 5-1. St Mary's then won their first home game of the season 4-1 against fellow Aldridge team St Thomas' before losing their only game of the season the following week away to Sheldon. St Mary's then went on a successful run seeing them win their next 7 games. During this time came the first real test of character of the 2013/2014 season. St Mary's knew that All Saints would be title contenders in that season so the first encounter of the season was an important one. At half time St Mary's found themselves 3-0 down and out of the game. In an incredible second half St Mary's scored 5 goals without conceding to turn the game on it's head. This game and show of grit and character showed how far this team had come over the last few years. The long winning streak ended with a draw against City Church at home at the beginning of December. Following the disappointment of dropping points St Mary's went on another incredible winning streak taking maximum points from the next 8 fixtures. The final game of the season saw St Mary's playing title chasers Sheldon. At this point in May the league could only be won by either St Mary's or Sheldon. With Sheldon having more games to play St Mary's knew that a win at home against Sheldon would seal the league title some 5 years after last tasting title success. St Mary's also had the incentive to win as Sheldon were the only team to have beaten them in the 2013/2014 season. In a frantic game St Mary's took an early lead before Sheldon equalised. St Mary's then scored twice either side of half time to return the WMCFL Division 1 Title back to Aldridge. Over the course of the season St Mary's had only conceded 19 goals (the least goals conceded over the 3 divisions) and had scored 86 goals (the most goals scored over the 3 divisions). A truly magnificent season in which St Mary's played the game the right way (winning the fair play award for least bookings and dismissals) which shows that hard work and character goes a long way in football.